In this paper, a low-redundant cosine-modulated nonuniform filter bank (LR-CMNFB) and its design method are proposed. The proposed LR-CMNFB consists of two parallel subsystems which have the same frequency division scheme. The nonuniform analysis and synthesis filters of the first subsystem are formed by directly merging the consecutive cosine-modulated versions of a lowpass prototype filter, and the filters of the second subsystem are derived to meet the aliasing cancelation condition. Since the aliasing of the two subsystems is structurally canceled without guardband constraint on the filter location, the shift-invariance and flexible nonuniform frequency division, two important properties in many signal and image processing applications, can be achieved simultaneously at the cost of low redundancy (that is less than 2). 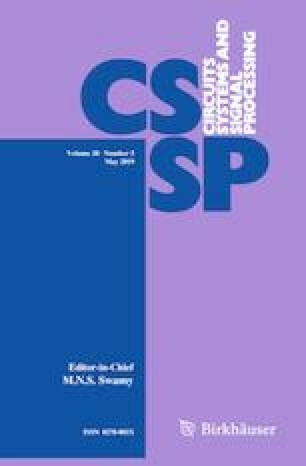 From a particular analysis on the filter characteristic and the reconstruction error of the whole system, it is found that the good characteristics of filters and the good reconstruction performance of LR-CMNFB can be jointly obtained by constraining the prototype filter to be the linear-phase spectral factor of a 2 Mth band filter. Several design examples are given to illustrate the performance of the proposed LR-CMNFB and its potential in practical applications. The work is supported in part by the National Natural Science Foundation of China under Grands 61403305, 61873200 and 61873201, in part by the Key Project of Shaanxi Key Research and Development Program under Grant 2018ZDXM-GY-089, in part by the Research Project of Shaanxi Provincial Education Department under Grant 2017JS088. which is just the expression of (33).